East Angels – U14s Girls team win UK Tournament and well done Paige. Please see Chris’s report (plus some editorial changes) on last weekend ASA U14 Inter-Regional Championship in Liverpool. Paige was the youngest of the girls in the East Angels team that made the long trip to Liverpool and came back from the tournament as Champions of the UK. 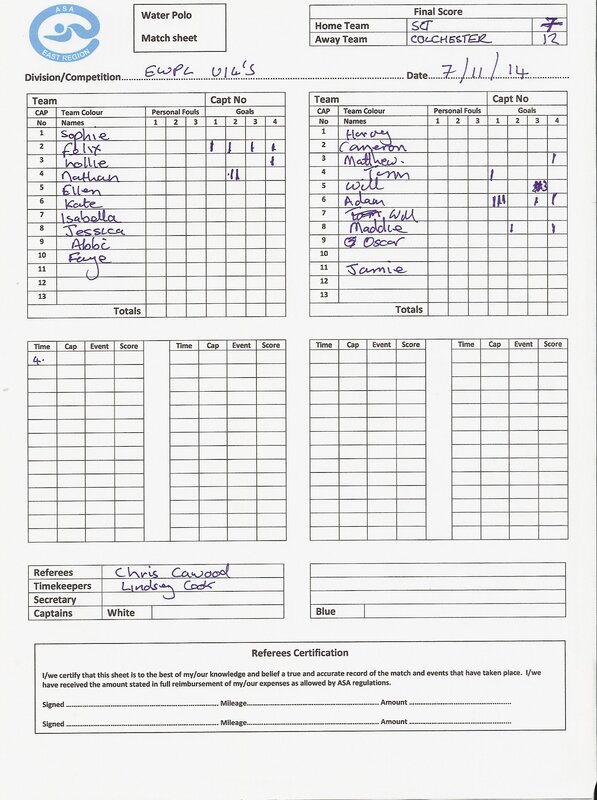 Match Result EWPL U14s – SC Torpedoes 7 Colchester 12. Well played to all the team on the night a competitive encounter, played in a good spirit enjoyed by players and spectators alike. More goals to cheer for than previous games – 4 for Felix, 2 for Nathan and a first competitive goal for Holly. Suffolk Girls and Herts Boys clinch titles – read full match report here. SC Torpedoes were represented in this tournament by Erin and Holly playing for the Suffolk girls side and Robert playing for the Suffolk Boys side.